This guide will explain step by step the correct procedures to successfully clean ink stains and marks from leather. Using our leather ink remover kit you can easily remove ink stains from leather furniture, car interior, clothes, handbags and all other items of leather. To remove the ink stain you will need the leather ink remover kit. It is also advisable to clean the area first using a leather cleaner. This is because cleaning with a normal cleaner removes any surface residues of ink and so you'll use less ink remover, and also, sometimes a normal leather cleaner is all that is needed. If you do not have a cleaner, use the leather ultra clean. 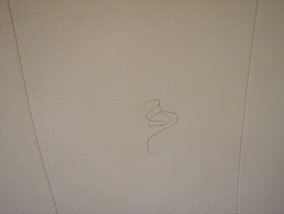 A child has scribbled with black biro onto the side of this cream sofa. A few simple steps are all that is necessary to remove the ink stain. First of all though, clean the panel thoroughly with a leather cleaner, or our leather ultra clean (recommended). Apply some of the leather ink remover onto a cotton wool bud and gently dab the ink to lift the stain. More stubborn stains may require rubbing or more pressure to be applied, but always start off gently and then get more aggressive. 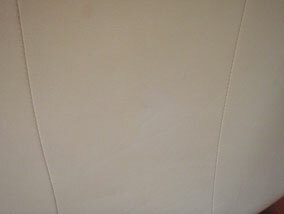 This video (left) shows the few simple steps mentioned above being employed to remove the ink stain from the leather sofa. Once you have cleaned the leather with the ink remover on a cotton wool bud, you will notice that the stain has been loosened and also slightly spread out like a cloud. Apply some ink remover onto a sponge and wipe the leather down to remove the cloud. Then clean the area down with the leather ultra clean to remove ay excess ink remover from the surface. Lastly, apply the leather protection cream to stop future ink stains. 1. The protection cream coats the leather with an invisible barrier (like scotchgard), which prevents the leather from absorbing dirt, grease & oils. Not only does this protect the leather by stopping these materials damaging the finish, but it also makes the leather easier to clean. After applying the protection cream to leather, it will wipe clean with a damp cloth since the dirt just sits on the barrier. The same applies for stains - easily removed with the ultra clean. 2. This barrier also reduces friction caused as you use the leather. Dirt and grime, combined with daily use slowly wear away the coatings on leather. The protection cream takes away this friction and so will help prolong the life of your leather. 3. Containing UV inhibitors the protection cream also helps prevent sun fading. Four Seasons Leather Care Plan: A year round plan to keep your leather in pristine condition. Leather Care Kit: A large leather care kit representing excellent value for money.